Today, we just got a chance to try the game Civil Warfare: Another Bullet in the War. The game is develop by Mental Zone Digital Game Studios a two man team dedicated on developing this new Battle Royale game. Currently, the game is in alpha state where you’ll probably see the very early development of the game and you’ll expect bugs and unfinished elements of the game. When opening the game, the main lobby of Civil Warfare looks similar to the PlayerUnknown’s Battlegrounds where they’ve change location of the menus. But they’ve got a very nice background with your player character which is appealing to all. The problem is when you start a match. Unfortunately, the game has not enough player that you can play with maybe because the game is still on alpha and don’t have enough community. But somehow I manage to enter a match with a mysterious player that let you try the game with zero player online. Since this game is in Alpha state, I’ll understand that most of the features of the game are still in development. But to give you overview, currently – what I found weird on the game is the movement of the character, opening of the door is too hard, UI character inventory, the shooting and the hard controls of the car. The map of the game is wide and you’ll probably enjoy looting to every houses you find the game. In mobile app, we’ve seen a lot of clone of the game Battle Royale and trying to replicate this kind of game to their different version and doing that is very difficult. Especially to the developer of Civil Warfare who’s a two man team that manage to deliver this somehow nice game. We’re hoping to see this game succeed in the future and hope they continue polishing this game for the public. Our suggestion to the developer, hope they make this game FREE for everyone so they can try it out and gives the game a community of players. Today, we just got a chance to try the game Civil Warfare: Another Bullet in the War. The game is develop by Mental Zone Digital Game Studios a two man team dedicated on developing this new Battle Royale game. Currently, the game is in alpha state where you'll probably see the very early development of the game and you'll expect bugs and unfinished elements of the game. When opening the game, the main lobby of Civil Warfare looks similar to the PlayerUnknown's Battlegrounds where they've change location of the menus. But they've got a very nice background with your player character which is appealing to all. The problem is when you start a match. Unfortunately, the game has not enough player that you can play with maybe because the game is still on alpha and don't have enough community. But somehow I manage to enter a match with a mysterious player that let you try the game with zero player online. Since this game is in Alpha state, I'll understand that most of the features of the game are still in development. But to give you overview, currently - what I found weird on the game is the movement of the character, opening of the door is too hard, UI character inventory, the shooting and the hard controls of the car. The map of the game is wide and you'll probably enjoy looting to every houses you find the game. 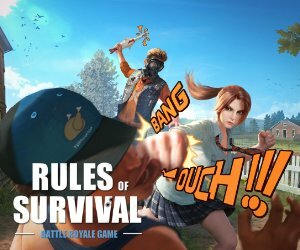 In mobile app, we've seen a lot of clone of the game Battle Royale and trying to replicate this kind of game to their different version and doing that is very difficult. Especially to the developer of Civil Warfare who's a two man team that manage to deliver this somehow nice game. We're hoping to see this game succeed in the future and hope they continue polishing this game for the public. Our suggestion to the developer, hope they make this game FREE for everyone so they can try it out and gives the game a community of players. A Free Game for everyone, but needs more polishing and people to play with. What's bad on this game, graphics are bad since it's in alpha state, character and car maneuver looks very weird and lack of real life movement. Shooting down enemy is very hard. And there are few people to play with.